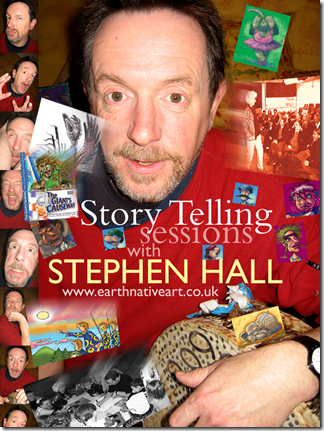 Stephen has spent the past ten years visiting schools and community groups as a storyteller. These sessions, generally lasting an hour/hour and a half, contain simple poems, music, interactive singing, humour with main stories utilising projected illustrations. Stephen has worked as close to home as Stormont/Parliament Buildings, Belfast, The Linenhall Library, Stranmillis College, Féile an Phobail/ The West Belfast Festival and as far a field as Donegal, The Wains Fest, Glencree, Centre for Peace and Reconciliation, Bologna with The British Council, The Gothenberg Irish Festival And Sioux Valley Native American Reserve, Manitoba, Canada.